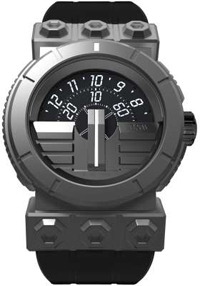 New, executed in a futuristic style, is presented in a round stainless steel or steel with black PVD coating. This time, the designers have chosen a different brand PSW time indication, namely using special discs that are at the top of the dial. The lower part is closed in black. Model from a collection of RSW Outland collected on the basis of the Swiss Valjoux 7750 automatic movement and comes on a leather strap.